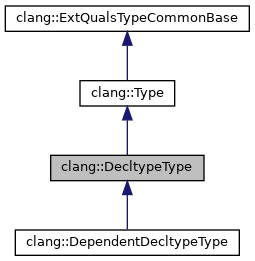 Represents the type decltype(expr) (C++11). Definition at line 4258 of file Type.h. Definition at line 3186 of file Type.cpp. Definition at line 4277 of file Type.h. Remove a single level of sugar. Definition at line 3198 of file Type.cpp. References getUnderlyingType(), isSugared(), and clang::ExtQualsTypeCommonBase::QualType. Definition at line 4268 of file Type.h. 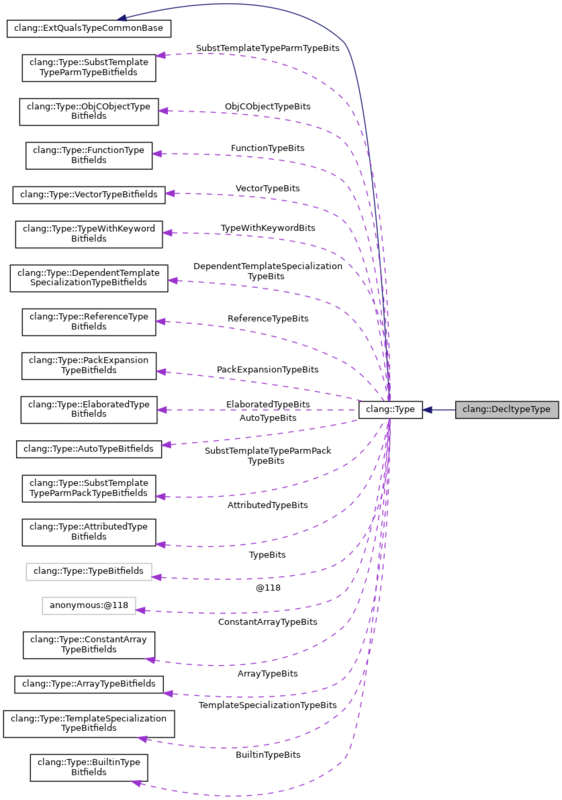 Referenced by addExceptionSpec(), clang::getParameterABISpelling(), clang::TemplateDeclInstantiator::InstantiateTypedefNameDecl(), mangleAArch64VectorBase(), clang::TreeTransform< Derived >::TransformExceptionSpec(), clang::ASTNodeTraverser< Derived, NodeDelegateType >::VisitDecltypeType(), and clang::ASTNodeImporter::VisitDecltypeType(). Definition at line 4269 of file Type.h. Referenced by addExceptionSpec(), desugar(), and clang::ASTNodeImporter::VisitDecltypeType(). Returns whether this type directly provides sugar. Definition at line 3196 of file Type.cpp. Definition at line 4263 of file Type.h.